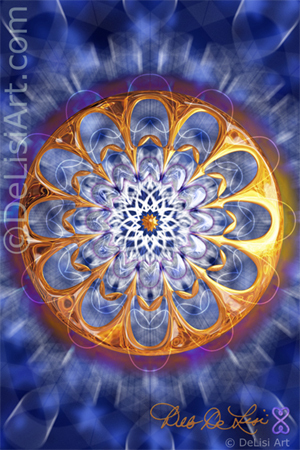 Since she was a child, Deborah DeLisi always knew that she was here to be an artist. From crayons to computers, she knew her purpose was to express herself through art and creativity. At the urging of her parents, (who were concerned how she’d make a living) she focused on the employable career of graphic design. Icons such as Andy Warhol, Peter Max, Walt Disney and Salvador Dali influenced her early years. Enjoying the left brain/right brain blend of art and business, Deb started her own successful graphic design and illustration company. Her ‘cutesy’ mainstream art was licensed for home decor, accessories, gifts and calendars, while her talents in designing packaging, brochures, catalogs and logos kept her graphic design clients happy. In 2005, taking a blind leap of faith, she gave it all up and followed her dreams across the country to the coast of California where she set out creating a new life, new energy and a new direction. Her first glimpses of this new direction came about unexpectedly, with some help from a person Deb views as a scientific visionary and the greatest mind of our time, Dr. Todd Ovokaitys, of Gematria Products Inc., a nutraceutical company in California. In 2004 while attending a science seminar where he was presenting, Deb experienced his Pineal Toning Technique™. The group toning during the seminar was a catalyst that expanded her creativity. With eyes closed and hearing only the vocal tones, Deb was surprised to see colors, energy and geometric shapes moving in her mind’s eye, as clear as an ‘inner movie’. She quickly sketched what she was seeing, and for many months afterward, would occasionally ponder what information was in the forms she saw. There seemed to be an inner understanding that went beyond the linearity of words. Two years after experiencing those initial tones, Deb turned her first sketch into a complete piece of digital artwork, which she named ‘Level 1’. Encouraged by the responses she was receiving—and with the help of a pineal toning group—she continued illustrating the other sounds or ‘levels’. One layer at a time, she creates each piece of art digitally, using the mouse as a paintbrush of light. Each piece of art is divinely guided and may be composed of up to 274 different layers that modify and relate to the ones above and below it. A pioneer in this type of art, Deb uses every technique and ability at her disposal to accurately translate the inner movie-scapes into tangible images that encapsulate the core energy of tones. The frequencies in the Pineal Toning Technique™ are thought to support and enhance the innate and untapped abilities in our DNA. 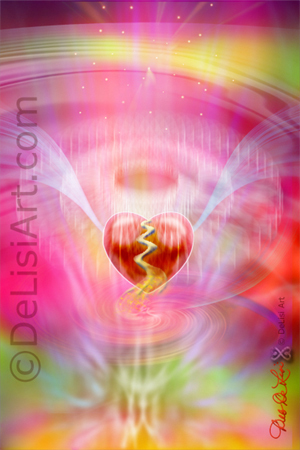 Each of Deb’s digital paintings contains these highly informational frequencies. 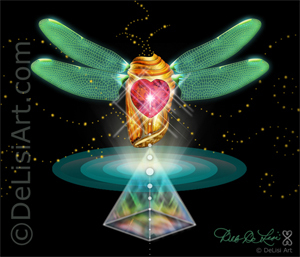 Customers have reported profound meditation experiences and various levels of healing with the art. achieve. 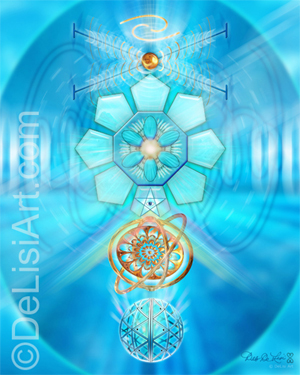 Many tell Deb that they see the same forms in meditation, and are thrilled to see a rendering of their vision. It’s seeing the energy of our soul as it moves about experiencing the universe, while still participating in this earth experience. 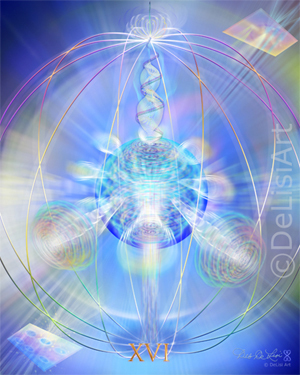 Today Deb continues to add to the above-mentioned series known as “DNA Activation Art”. She loves bringing the visions to life, and each finished piece never fails to surprise her. She also paints other inspired images using traditional methods such as acrylic on canvas. In 2010 she was guided to design wearable art, creating a chakra balancing and healing silk scarf. Next on the horizon, Deb hopes to see her paintings move through animation, and after that…on to holograms! Like everything she brings to the world, she intends it to be “art with a powerful purpose”.